Dhaka, Apr 3 (Just News): The medical board which was formed to check up BNP Chairperson Begum Khaleda Zia has recommended x-ray and blood test for her treatment. 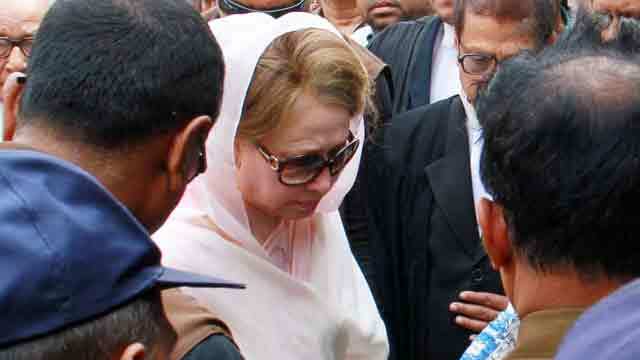 Khaleda Zia landed in Dhaka’s old central jail as she was convicted in a case. The four-member medical board today sentits recommendation to the jail authority in this regard. Responding to a query over the issue, Home Minister Asaduzzaman Khan Kamal has said his government will initiate necessary measures based on the recommendation of the medical board. On Sunday, members of the medical board visited the BNP chief at the central jail and on Monday they said that Khaleda Zia is ill but she is not in serious state. After visiting Khaleda Zia, Prof Shamsuzzaman, who is head of the four-member board and chief of the orthopedics of the DMCH, told reporters that the BNP leader has been suffering from pain in her neck, hands and legs. In the recommendation, Khaleda Zia has been asked take exercise regularly. Alongside this, x-ray and blood test have been recommended for the sake of her treatment, Shamsuzzaman said. "After all, she is ill but her illness is not serious," the medical board chief said.